Today, the most ubiquitous devices in our homes and offices are finding a new place in the healthcare arena. Consumer devices – like smartphones, tablets and VR headsets – are transforming care by making it easier, more affordable, and more efficient. Digital health is the next frontier of healthcare. Across the entire care continuum, hospitals, clinics, and other institutions have recognized the transformational role technology can play in helping practitioners treat patients in more efficient, less expensive ways—all while producing better patient outcomes. As calls for value-based care grow louder, it’s incumbent on healthcare leaders to find and deploy the next generation of impactful healthcare technology. Traditionally, these innovations have been products and services designed especially for medical environments. But while effective, these solutions are often applicable only in certain places, like operating theaters or ICUs. This leaves countless arenas in need of new technologies to help them run smarter, operate more efficiently, and better serve patients. That’s why, increasingly, providers are turning to digital consumer technologies that we already use every day. Today, the most ubiquitous devices in our homes and offices are finding a new place in the healthcare arena. Virtual reality is providing new, cost-effective, non-addictive treatment options for patients with a wide range of conditions. Tablets and IoT-enabled sensors are making it possible for seniors and people with disabilities to live healthier, more independent lives. And smartphones and wearable devices are streamlining the entire continuum of care, by empowering all of us to take control of our own health and wellness. America’s opioid epidemic has reached dangerously high levels. The crisis has proven to be extraordinarily costly, both in lives and in dollars. An estimated 115 Americans die every day as a result of drug overdoses, and one study of a West Virginia hospital found that the hospital lost $3.5 million in a single year treating rising infection rates among patients taking opioids. Policymakers and legislators will continue to debate legal and regulatory fixes to the problem, but in the meantime, healthcare institutions need to act. Here, consumer technology—specifically, virtual reality—can play a vital role, by giving practitioners and patients the non-addictive pain management tools they need, while potentially cutting costs at the same time. VR holds particular promise for the noninvasive, non-addictive treatment of patients with chronic or acute pain, potentially offering an alternative to opiates and other traditional pain treatments. Clinical trials performed at Cedars-Sinai Medical Center in Los Angeles, CA have shown that VR-based treatments are an effective tool for reducing pain. In a randomized controlled trial enrolling 120 patients, hospitalized patients experienced a 52% reduction in pain when receiving the VR treatment, with pain relief extending even after the headset was removed. Additional studies are underway to determine how VR solutions, when used in tandem with other digital tools including wearables and nerve stimulation devices, may reduce pain and lower costs for patients with orthopedic work-related injuries. Beyond pain, recent research has shown that virtual reality can be effective in treating other types of conditions such as macular degeneration, post-traumatic stress disorder, stroke, and spinal cord injury. The AARP has reported that nearly 90% of seniors want to stay in their own homes as they age. For seniors who are debilitated due to chronic disease and/or disability, this often requires in-person home care, which can be costly and intrusive when provided around the clock, and ineffective when performed for brief daily periods. But now, wearables and smart homes can be leveraged not only to enhance daily living, but also to link patients to their family and healthcare providers for real-time care—without the costs and hassle typically associated with in-home visits. In recent years, IoT-enabled sensors have made it easier and more efficient than ever for care teams and loved ones to ensure that seniors and people with disabilities can enjoy optimal living conditions in their homes. Motion sensors that have been strategically placed in the bedroom, bathroom, kitchen, medicine cabinet, and dining areas can identify gradual changes in baseline activity and enable proactive intervention when an individual’s condition is worsening. Connected appliances, thermostats, and utilities can automatically notify care teams in advance of a potentially hazardous incident. And connected refrigerators are making it easier for loved ones to ensure that independent seniors always have enough healthy food at home. Samsung works with a number of partners to customize its products for seniors and/or others requiring ongoing medical supervision. Breezie is a Samsung tablet that has been preconfigured to optimize the user experience for technology-naïve seniors, and when combined with a social engagement program sponsored by the National Council on Aging (NCOA), it has been shown to increase socialization, cognitive function, and physical activity in low-income seniors with little to no prior computer experience. Another Samsung tablet solution that has been well adopted by seniors is the Vivify Health platform. Vivify Health offers clinicians the ability to monitor a senior’s ongoing health with remote patient monitoring devices such as digital weight scales, blood pressure cuffs, and glucometers. It also enables HIPAA-compliant video conferencing between the clinician and the senior. Meanwhile, smartwatch solutions by MobileHelp and Reemo offer seniors a highly intelligent device with monitoring and emergency response capabilities— as well as providing the ability to monitor a senior’s location, activity, and the battery life of the watch. More and more smartphone users are using their devices to take control of their own health and wellness via mobile solutions. Samsung Health enables users to track daily health habits captured from wearables, smart phones, and/or other peripheral devices and sensors. Samsung Health turns your smartphone into a proactive, preventative tool that puts your health in your hands. Of course, monitoring our health comes with different concerns at different points in our lives. Children might require quick check-ins when a fever soars or a cough persists, while patients with chronic conditions might require more direct, ongoing communication and care from providers. Here’s where smartphones become even more crucial. For many of us, the smart phone has become the most important device in our life. It is now helping us to live better, healthier lives, by equipping us with the tools that we need to monitor our own health, and by connecting us with medical professionals with the touch of a button. Today, the most exciting new healthcare technologies aren’t new imaging machines or robotic surgery systems, but the ubiquitous consumer devices that so many of us already own. 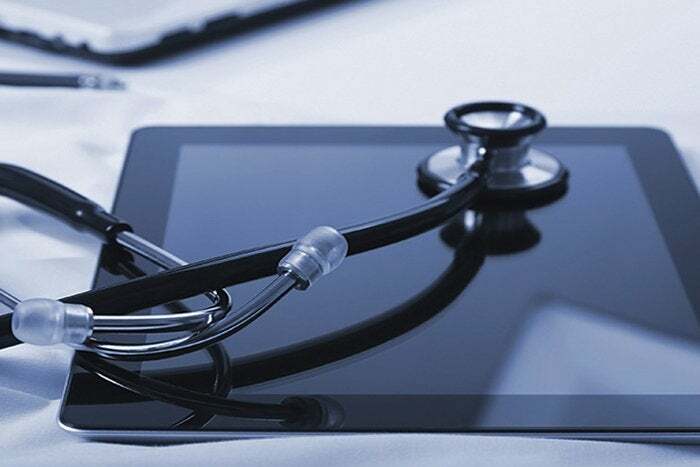 Healthcare solutions delivered on consumer technologies are transforming care and making it easier, affordable, and efficient for patients to access healthcare and for healthcare professionals to meet their patients’ needs. Dr. David Rhew is the Chief Medical Officer and Head of Healthcare and Fitness for Samsung Electronics of America, He oversees and/or directly influences the development, sales and marketing of enterprise B2B healthcare solutions and consumer-targeted B2C fitness devices for Samsung Electronics.